Using our new floor/ceiling projections, this season we will be able to simulate all of the DraftKings NFL Pickem tiers. We’ll share the results of these simulations in a premium article for subscribers along with other ideas about attacking the DraftKings NFL Pickem slate each week. Before we get into the specific tiers and probabilities, let’s talk a bit of general strategy. One of the edges in tournaments in Pick ‘Em games is as simple as making correlated lineups. For whatever reason, when the average DraftKings user is making rosters in Pick ‘Em games, they tend to view it as eight isolated picks rather than a cohesive lineup. This does not mean you ALWAYS have to stack… for example, it is quite possible for Marcus Mariota to have a good game without Corey Davis, however, if you play Tom Brady its a lot less likely that Hogan, Gronkowski and Burkhead ALL fail. 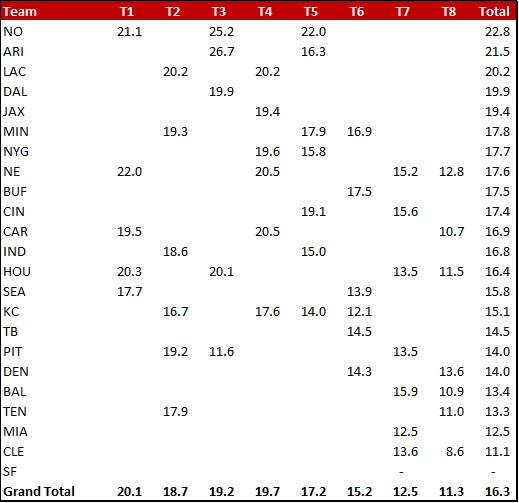 Here’s a grid of the average projected fantasy points by tier and team to help you identify stacking options. Please note some of these teams have multiple players within the same tier. You can naturally see teams that may make sense to stack (LAC fits really well with NO, HOU, SEA but not as well with CAR since they overlap in tier 4). If using Ben Roethlisberger in Tier 2, you have the option of stacking him with Antonio Brown (our highest projected WR) in Tier 3 or with Juju Smith-Schuster in Tier 3. The NE-HOU game has a few different stacking possibilities. You can use either Brady or Watson in Tier 1, paired with both a teammate and an opponent coming back the other way. The New England options to pair with Brady are Rob Gronkowski in Tier 4, Chris Hogan in Tier 7, and Rex Burkhead in Tier 8 (maybe a better option coming back in HOU stacks rather than with Brady. The Houston options to pair with Watson are DeAndre Hopkins in Tier 3, Lamar Miller in Tier 7 (like Burkhead, possibly better coming back in New England stacks, but both backs will contribute in the passing game), and Will Fuller V in Tier 8. 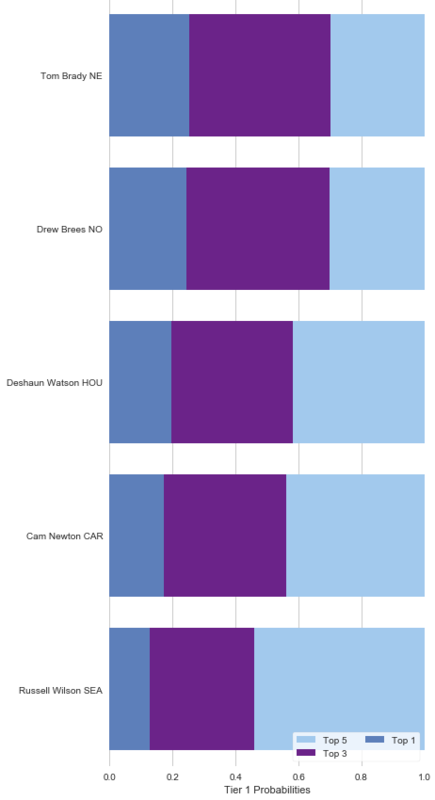 While those are the three main stack possibilities, other appealing ones include Patrick Mahomes (KC, Tier 2) with Travis Kelce (5) or Tyreek Hill (6), Kirk Cousins (2) with Adam Thielen (5) or Stefon Diggs (6), Philip Rivers with Keenan Allen (4) or Melvin Gordon (4), and Drew Brees (1) with Alvin Kamara (3) or Michael Thomas (5).